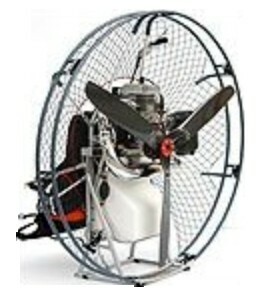 The Max is a paramotor suitable for pilot weight from 130 lbs. to 440 lbs. The same reliable powerplant as on the FLY Products Gold unit; Simonini Mini 2 Plus (G24) engine of 28 HP 200 cc. with electric starter, power ignition, airbox, chromed tune pipe exhaust with an extra muffler (silencer) and wooden propeller but fully portable, 6 piece dismountable cage and 2 piece dismountable frame for easy transport. Two sizes available.